Effective May 6, 2015 registers are hard-coded to not allow credit card reload. PIN-based debit cards are working, however YMMV. PIN-based debit cards may be refused by cashiers. WHAT IS TARGET PREPAID REDCARD? Prepaid Redcard is a reloadable American Express card. It is only available to purchase at select Target stores. Redbird can only be purchased in store. Cannot register online without temp Redbird card. Temp Redbird cards CANNOT be purchased with CC with initial load of up to $500 (minimum load appears to be $1, although documentation states $0.01 (see post #654)). Cannot have an existing Bluebird or Serve account. If you have an existing Bluebird or Serve account, you will need to close that account before registering for the permanent Redbird card. This site may error when in Firefox, especially with adding payees / bill pay. Customer service says to use Chrome or Internet Explorer. All "Monthly" limits are per calendar month and reset on the 1st of each month. Daily limits reset at midnight Eastern time, 9 PM Pacific time. *For online debit load, only use of bank-issued cards is allowed. The use of pre-paid debit cards (Netspend, Paypower, Univision, Paypal, etc.) and VGC/MGC/AGCs is not allowed. Your account will be flagged upon first/second attempt. No-fee ATM usage at US Target stores* and U.S. Allpoint network ATMs. (ATM usage not available at any other ATMs.) Find an Allpoint ATM at: www.allpointnetwork.com Note that some ATMs only allow $400/transaction. 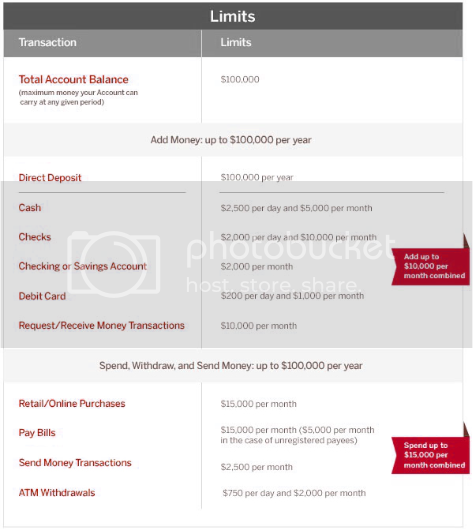 There is a $750/day and $2,000/month limit to ATM withdrawals. Q: Can I reload a RB at a Target that doesn't sell RB? Q: Can I buy or reload a RB in North Carolina? There is currently a software issue preventing any reload of any kind in NC. It is a known issue but there is no ETA on a fix. Q: Can I reload the RB at any register, or just at the Customer Service desk? It can be done at any register, however some cashiers are not trained on how to do this and you may have to go to Customer Service. Q: What is the most efficient way to drain a RedCard? Use BillPay to pay bills. For example, pay the credit card you used to load RedCard with. You can also withdraw money at ATMs. Q: I cant access the BillPay feature through the RB website! Verify that your account information correctly reflects a 10-digit phone number (including area code). Numerous people have reported that their account only had a 7-digit phone number (no area code) and that, after updating to a 10-digit phone number, BillPay miraculously started working. Q: Can we buy a temporary Redbird card while we still have a Bluebird or Serve account? Q: How many Redbird cards can you purchase at once? You can only purchase one Redbird card a day per SSN. If you plan to purchase more than one, be sure to use a different SSN for each purchase to avoid activation issues. Q: Can we register our temporary Redbird online while we still have a Bluebird or Serve account? No. You will have to cancel your Bluebird or Serve account first before registering. Q: How do I cancel my BlueBird or Serve Account online? Do I need to call them? Frequent Miler posted a useful trick that will help you cancel online How to cancel Bluebird online This works for both BlueBird and Serve. Q: Cancelled Bluebird, why does registering Redbird error out saying Bluebird is still active? If you have open transactions that have not been settled, like BillPay checks that have not yet been cashed, the account cannot settle and will not be truly closed. Thus Target will reject it until it's permanently closed. Q: Can we get Redbird online? No. The only way to get Redbird is to find a participating Target store and buy a temporary card there. Some people have purchased RB on Ebay, Amazon, or through private deals. Be aware that doing so may violate the TOS of one or more of these services. Also be aware that buying an un-activated RB, you are potentially buying "stolen" merchandise; the seller *may* have simply taken the un-activated RB cards from a target store without permission. At best they got permission from a low-level employee; they certainly are not getting permission from someone authorized to allow sale of RB outside of the current Target-authorized roll out markets. It is highly recommended to only buy already activated Redbirds because many Targets which do not offer Redbirds also will not be able to activate them and you will spend a month with the Customer Service line trying to get a new one. Q: Does the initial load you put in when purchasing the Redbird count against the monthly limit? No. After registering the Redbird online, any loads done will count against your monthly limit, even on your temp card. Q: Can we load Redbird with Target gift cards at Target?NO. When loading, the register displays a large message saying that gift cards cannot be used to pay for this transaction. Q: What are the card’s load limits per transaction at Target? [B]As of 2/2/2015 there is a maximum $1,000 load per transaction. You can no longer load the same RB multiple times (multiple swipes) in 1 transaction. Likewise, you can no longer load multiple RBs (say your's and your spouse's) in 1 transaction. Maximum of 1 load, for $1,000 per debit card payment. End of story. Q: What credit cards can I use to reload RedCard in Target stores? NONE. As of May 6, 2015, credit cards cannot be used to reload. Q: Can I reload with a debit card? Yes, but only if the debit card can be authenticated with PIN-number. Signature-based debit that processes on the Visa/MasterCard/AmEx networks will NOT work. Q: Can I reload with a prepaid debit card or Vanilla Visa? Yes, but only if you have a PIN for that card. Q: How can I load 2 debit cards in one transaction? Example 2x$500. 1. Swipe debit card on my terminal after total comes up $1000. 2. PIN pad comes up. Enter 4 digit PIN. 5. Cashier reads something on register, asks how much on this card. $500. They push something to continue. 8. Receipt prints. Thank cashier. The end. Q: Can someone else buy a Redbird card for you? Yes. When you buy a temp Redbird card at Target, you have to give them your drivers license info, your SSN (can be any set of numbers, does not need to be real), birthdate, and more. Then, you have to register the card online in order to get a permanent card. In the process of registering online, they ask for the birthday of the original buyer on the first screen, but you can put your own and it will still work. Either way, you can still change the details on the following screens. I did this for my wife. I bought the card at Target and used my own driver’s license, SSN, etc. But, when I got home, I registered the card to my wife. I can’t promise this will work for everyone, but it worked for me. Q: Can you reload Serve/Bluebird at Target? Q: How do I contact Target's support team to resolve an issue with my RedCard? Call Target's Prepaid Resolution Team, their direct telephone number is 800 438 6468 (open from 8AM to 430PM MST). Q: Can you have both Redbird and AFT cards? You can have both Redbird and AFT since they are independent products. Q: I got a "Pending" notice that the registration is being reviewed, what now? I called Amex at March 11 for the missing 1K on Feb 25. Amex rep told me to wait for 10 regular days. I called today again to check for the status, I was on hold for 20 minutes and the Amex rep finally told me that they still have issues to fix and asked me to wait for 45 days from March 11 before checking for new status. Goodness, it will be April 25 before I can ask for a new status update. Yesterday I transferred funds from my Redcard account to my linked checking account. My RC online transactions displayed this transfer as "pending" or "processing" (I forgot the word). And my RC balance reflected the removal of the funds. Today, the transfer does not appear at all in the list of transactions. The funds are still deducted from my RC balance, but not yet appearing in my checking. There's nothing to indicate that it's still pending. I called to be sure, and the RC rep can see the pending transfer, and "nothing to worry about." But still, it was a little unnerving to not see the funds in either account. I guess that's what the 2/25 folks must be going through. Next minute, next hour, next day, next month always is the one following, no anbiguity whatsoever. Next Tuesday would be the Tuesday that follows. So on a Saturday, next Tuesday would be 3 days later. On Saturday, maybe. Not on Sunday or Monday, since those are in the same week. If he had said "next summer" last October, there wouldn't be a debate. No, there is ambiguity, depending on how close you are to Tuesday and personal usage. If I said "Next Tuesday" on Monday night most people would assume the Tuesday 8 days later. Also, "This Tuesday" spoken before Tuesday can mean the same thing as "Next Tuesday". English is simply not as precise as you want it to be. I think that's a good thing, actually. Did you get an email notification about the manual adjustment or did you see it only after you logged in? Hi all, just coming across this card and think I understand the basics, but would appreciate if someone could confirm. - Can use RedCard Billpay to pay bills I normally can't with credit card - auto loan, mortgage, credit card. The downside is that I can't automatically do this as with my bank's billpay - that is, I will need to log in and manually pay each bill. Sounds like a nice way to get some bonus CC points for bills at the tradeoff of some inconvenience. I hope you realize it was 100% a joke meant in good humor at some of the repetitive topics we keep going over and over again. I do understand not everyone has the same sense of humor and I apologize to anyone who doesn't find it funny. That is a hilarious thread summary. , You good Sir are my Hero!